I have always seen the Bible as a collection of cool stories of great men and women of our faith. I was wrong. The stories are wild. The men and women are not always great. I mean, not at all. They are honestly pretty messed up. A lot of them do horribly dumb things and don't trust God and argue with Him, and whine and complain and disobey over and over and over again. But I have come to realize that the Bible isn't about the characters. The Bible is about God. The narrative is telling the story of God bringing His creation back to Himself. And it starts with Exodus. In eight sessions, we will read through almost every word that was penned down in the book of Exodus and study what they tell us about God. Designed to be used with the Exodus Study Guide, each week we will dive into several chapters for study, discovery, application and discussion. As a little girl, I loved the idea of getting mail. And to be honest, even as an adult, I still do. There is something about receiving something unexpected, addressed specifically to me that feels special. It feels personal. It feels important. In the early days of the church, a letter was sent to the church of Colossae. It was special, it was personal and it was important. 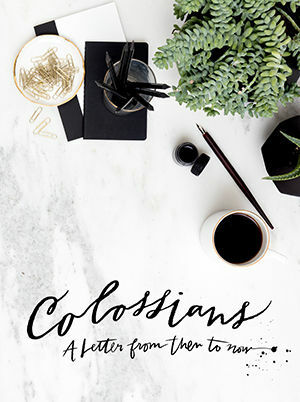 Paul wrote a letter to the church that we have the privilege to read for ourselves and experience what the people of Colossae did. And while this letter was not addressed to us, there is so much for us to learn.